Resistance held. At the time of analysis (July 14), 2080 seemed like THE key level, but late last week I discovered the following S&P 500 pattern, shared via Sunday’s (July 26) Profit Radar Report. 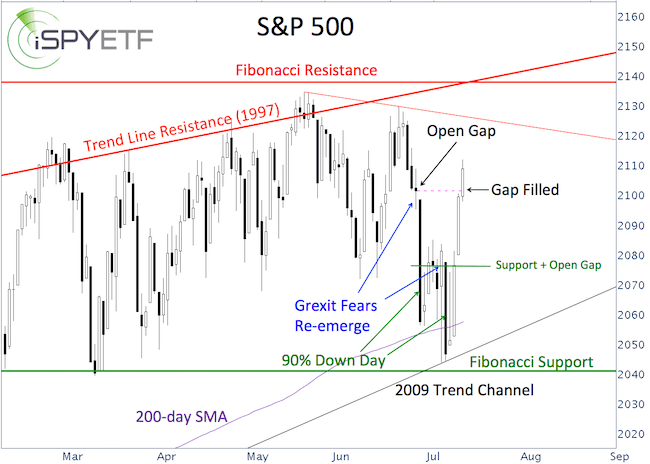 “The weekly S&P 500 chart shows three developments worth a look. 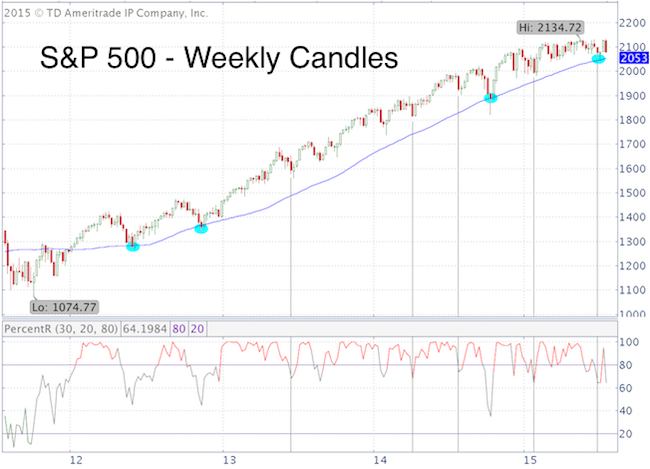 Since 2012, the S&P 500 found support at or near the 50-week SMA several times. Last week’s red candle put in a bearish engulfing week and painted a formation called ‘bearish harami’. In recent times, bearish haramis haven’t been as bearish as they used to be. Last week’s drop triggered a bullish percentR low-risk entry (click here for explanation of percentR). This week, the S&P 500 fell within 8 points of its 50-week SMA and S&P bounced again. S&P 500 seasonality suggests higher prices, but breadth is terrible. With or without new highs, a deeper correction (possibly into October) is likely. A move below the 50-week SMA and support at 2,040 would caution that the correction has begun. Continued S&P 500 analysis is available to subscribers of the Profit Radar Report. Since September 2014, the Nasdaq Composite suffered seven false. This is the most ever. 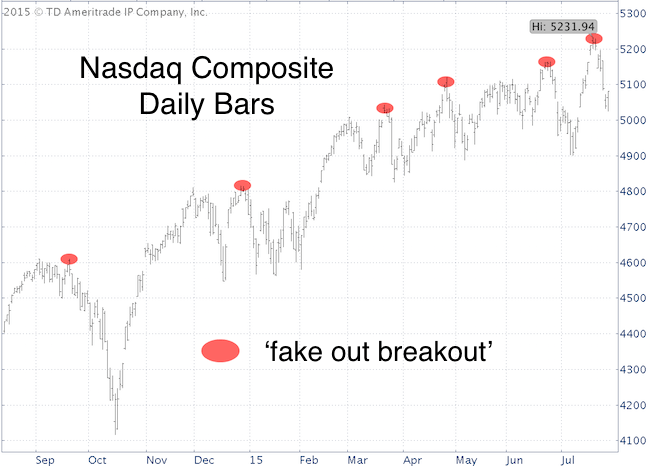 A false breakout, or fake out breakout, is a break above prior highs followed by drop back below (red ovals). Obviously, if you are an investor who buys the breakout, the Nasdaq’s recent habit is quite annoying. The Nasdaq Composite consists of all stocks traded on the Nasdaq (about 3,000), but there is no Nasdaq Composite ETF. The PowerShares QQQ ETF (Nasdaq: QQQ) is based on the Nasdaq-100 (100 of the largest domestic and international nonfinancial companies listed on the Nasdaq). 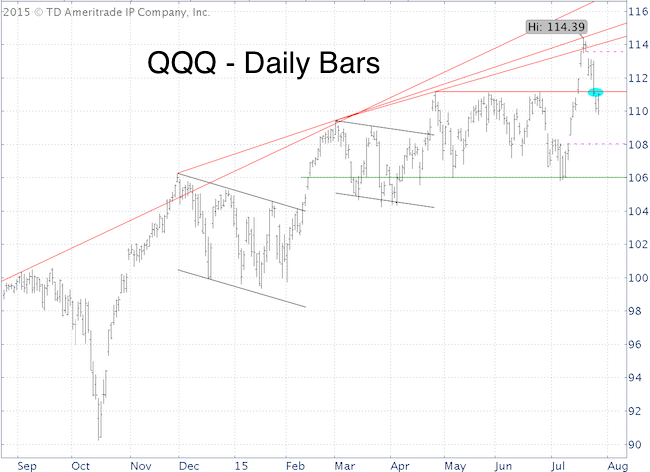 Subsequently, the QQQ ETF dropped below support, and is now trying to get back above prior support (now resistance). Historically, clusters of fake out breakouts are not necessarily bearish. A bigger and better reason for caution is lagging breadth. There are open chart gaps at 114.20 and 108.50. Odds are that both gaps will get filled, the question is in which order. More chopping action may be ahead. The S&P 500 chart offers a bit more clarity than the QQQ chart right now. Here’s the S&P 500 forecast. Post AAPL Earnings – What’s Next for the Nasdaq? On Friday, the Nasdaq QQQ ETF literally jumped higher, propelled by Google’s 13% gain. However, Google’s massive rally covered up internal Nasdaq weakness. On that day more Nasdaq-100 components were actually down than up. New highs on negative breadth is a rare feat. Nevertheless, the Nasdaq managed to do the same thing again on Monday. The Nasdaq Composite is made up of about 3,000 stocks (compared to 100 for the Nasdaq-100). On Monday, there were 940 more stocks down than up. Here’s another breadth measure, illustrated visually via the chart below. 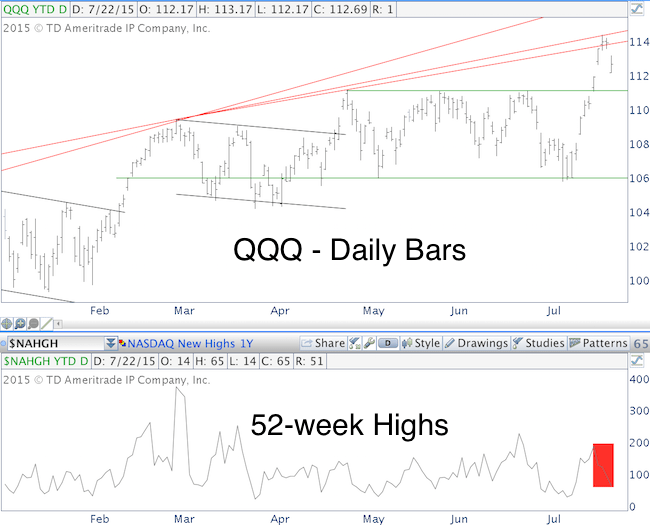 The upper bars represent the PowerShares QQQ ETF, the lower graph the number of Nasdaq Composite stocks at new 52-week highs. The number of stocks at new highs fell from 189 on Friday to 97 on Tuesday, a 49% drop. My most recent Profit Radar Report highlighted lagging breadth and bearish divergences and warned of a pullback. AAPL (Nasdaq: AAPL) dropped as much as 7% in post-earnings after market trading and gapped below support this morning. 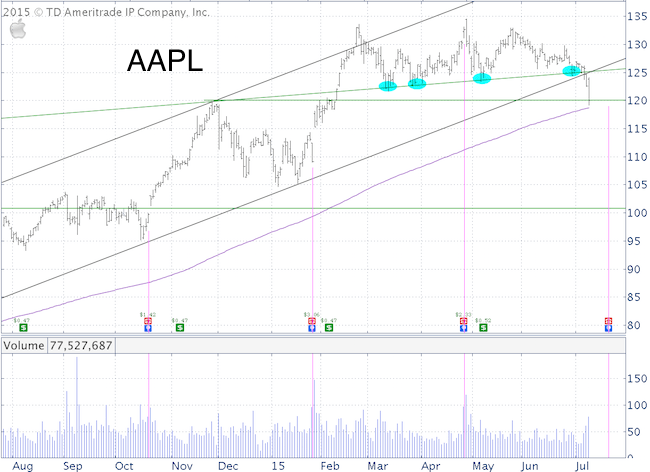 Click here for detailed AAPL analysis. What’s next for the Nasdaq? The bottom line, based on a number of indicators, is this: The potential for a nasty Nasdaq selloff exists, but another rally leg to new highs seems more likely. The green lines (around 111 and 106) should provide support for the QQQ. If they don’t, watch out. Every gold bear should know that the market has a nasty habit: It likes to fool the crowded trade. Based on the above headlines, short gold is the crowded trade. Past experience has shown that using a combination of seasonality, sentiment and technical analysis to project (or at least try to project) gold prices is most effective. 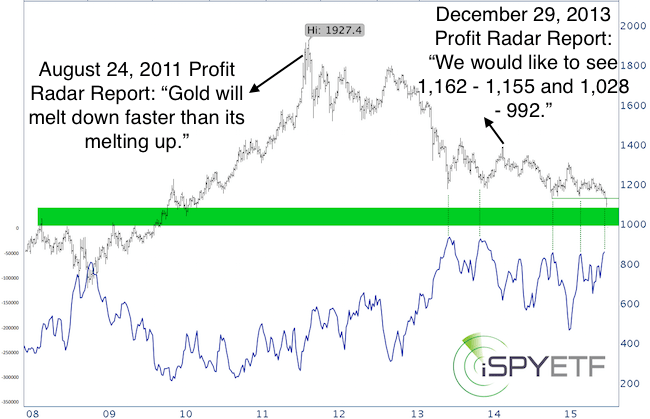 Using this approach helped prepare for the September 2011 all-time high (August 24, 2011 Profit Radar Report: “Gold will melt down faster than its melting up. At some point investors will have to sell holdings to pay of debt or answer margin calls. The most profitable asset is sold first. Gold has been the best performing asset for a decade and a liquidity crunch could produce sellers en masse”). Gold did bounce right around 1,162 – 1,155 last year, but is now coming back to test 1,028 – 992. Gold seasonality projected a rough second half of July, but is turning significantly bullish in early August. Most gold sentiment gauges are nearing extremes. 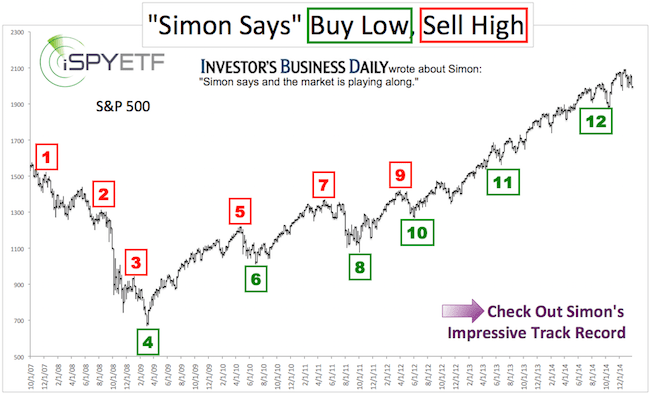 Trend followers (the crowded trade) are bearish, but business insiders (smart money) are anticipating higher prices. The chart above plots gold prices against the net futures positions of commercial hedgers (= people or entities in the business of mining, transporting or trading gold). This is the latest available data, but since the CFTC reports on Friday (using data of Tuesday), it is already over a week old. Chances are commercials are even more bullish now than shown on the chart. Regardless, commercial hedgers have scaled down their short exposure in anticipation of rising prices. Their timing is not always right on the money, but they rarely end up on the wrong side of the trade. Gold is nearing a long-term support zone. A new low against a bullish RSI divergence, panic selloff (which Monday could have been) or move back above 1,135 is likely to spark a tradable rally. This doesn’t mean gold won’t resume its decline later on, but prices appear to be near a short-term exhaustion point. Silver ETF prices are near the lowest level since 2010, and there’s been one of the quickest changes in opinion ever. Back in May, commercial hedgers (considered the ‘smart money) held the biggest short position since 2010. Prices slipped 10% since, so hedgers weren’t wrong per say, but the decline was shallower than on similar previous occasions. Now, only six weeks later, commercial hedgers are much more bullish. 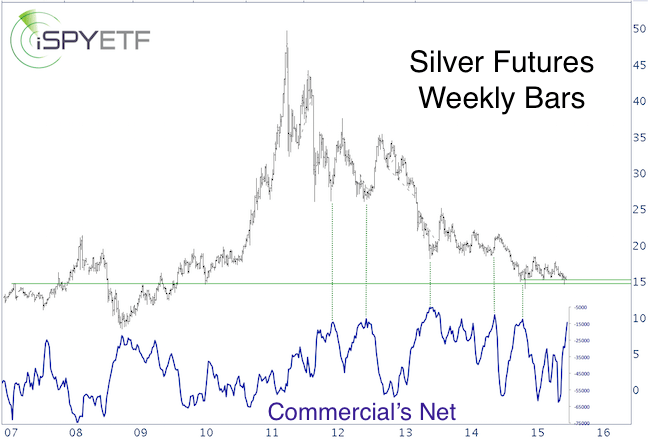 As the silver chart shows, silver is at or near long-term support. The same is true for the iShares Silver ETF (NYSEArca: SLV). Based on sentiment and long-term support, the odds of a silver rally have increased. But sentiment extremes in itself are not a reason to buy. At least seasonality and technical analysis have to confirm a buy signal. Perhaps sentiment will even become more extreme (silver COT data released tomorrow). A more detailed silver analysis, including short-term technicals and silver seasonality, is available via the Profit Radar Report. Will the S&P 500 Rally to New All-time Highs? How quickly things change. Just a week or two ago, stocks tumbled and fear soared. The first wave of re-emerged ‘Grexit’ fears (June 28) knocked the S&P 500 down 45 points in one big swoop, and another 15 points via a 7-day grind (see chart). Thanks to hopes for an ‘aGreekment’ stocks soared higher this week. Of course, it’s easy to explain the past with hindsight and a few news events. The problem with this approach is that it only works in hindsight, since no one can foretell the news. A more comprehensive approach generally offers more future insight. A look at the past will help determine what’s next. Following the initial June 29 mini-meltdown, the S&P 500 (NYSEArca: SPY) bounced around until it got hit again on July 8, when it closed below the 200-day SMA for the first time since October 20, 2014. On that day (July 8), the Profit Radar Report wrote that: “We don’t put too much weight on today’s close below the 200-day SMA. More important is support at 2,040. Today’s decline may have exhausted selling, at least temporarily. The odds for a bounce are good. The open gaps at 2,081 and 2,101 could be targets”. Here is where understanding how a price bottom came to be (although it’s rear-view analysis) can be valuable. The June 29 and July 8 mini-meltdowns were 90% down days, which means that 90% or more of volume was to the down side, and 9 out of 10 stocks closed lower. Multiple 90% down days can be a reflection of exhausted selling pressure. Based on the two 90% down days, the June 8 closing low may stand for a while. The up side target (open chart gap at 2,101 – dashed pink line on chart) was captured yesterday. Unfortunately, that puts the S&P 500 in a sticky spot. Short-term overbought, but with the potential of having established a more robust low. Stocks are reaching overbought territory, so resistance at 2,115 – 2,125 is worth watching for a pullback or relapse. There is no high probability setup right now, but my best guess is that new highs will be coming, perhaps after a smaller pullback. Support and an open chart gap are around 2,080, which may be a low-risk spot to buy (with tight stop-loss). Failure to hold 2,080 and more importantly 2,040 could unlock much lower targets. Continued analysis, based on sentiment, seasonality, technical analysis, supply & demand (and a little bit of news) is available via the Profit Radar Report. Apple’s slow slide lower accelerated earlier this week after falling through trend line support at 125. This trend line buoyed prices seven times since mid-March (blue ovals), but the jug can only go to the well so often before it breaks. Once Apple (Nasdaq: AAPL) broke below 125, it quickly moved to 120 on high volume. 120 is important, because it represents the November and January highs. It just so happens that the 200-day SMA is just below 120. The 200-day SMA is the go-to indicator for many investors, which ironically makes it more susceptive to whipsaws. With or without whipsaw, 120 is an important level to watch. Another important level (based on the log scale chart) is 116. July 21 is an important date if you’re thinking about buying or selling AAPL. That’s when AAPL releases its earnings (after the bell). AAPL tends to pop the day after earnings (pink), but that’s not guaranteed. The last all-time high occurred the day after earnings, and it’s been down ever since. According to UBS, half of AAPL’s revenue growth cames from China. According to FactSet, China accounts for 16.2% of AAPL’s total revenue. Chinese stocks are down 30% since June 5. This could make its way into earnings … and spook investors. AAPL seasonality suggests being careful in July and early August. Click here for AAPL seasonality chart.